The Gerritsen On- & Offshore Services BV company have handled a routine turbine maintenance procedure being undertaken on an offshore location in the Southern North Sea. 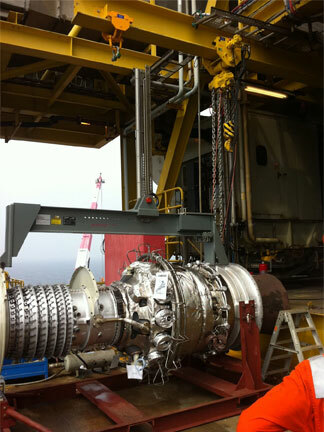 This involved four of their personnel, utilising an air operated hoist unit manufactured by the J D Neuhaus company for the safe and effective lift and manoeuvre procedures for a turbine lift load of 12000kgs. The turbine was responsible for supplying power to a gas-compressor utilised for power, steam and other general services. The JDN hoist was a Profi TI and this unit was also combined with an overhead rail mounted trolley, also air powered, to provide horizontal movements of the load. For maximum safety of operation in offshore conditions, a rack and pinion drive was incorporated into the trolley mechanism, with the whole lifting package also incorporating a spark resistant finish for operation within potentially explosive atmospheres. 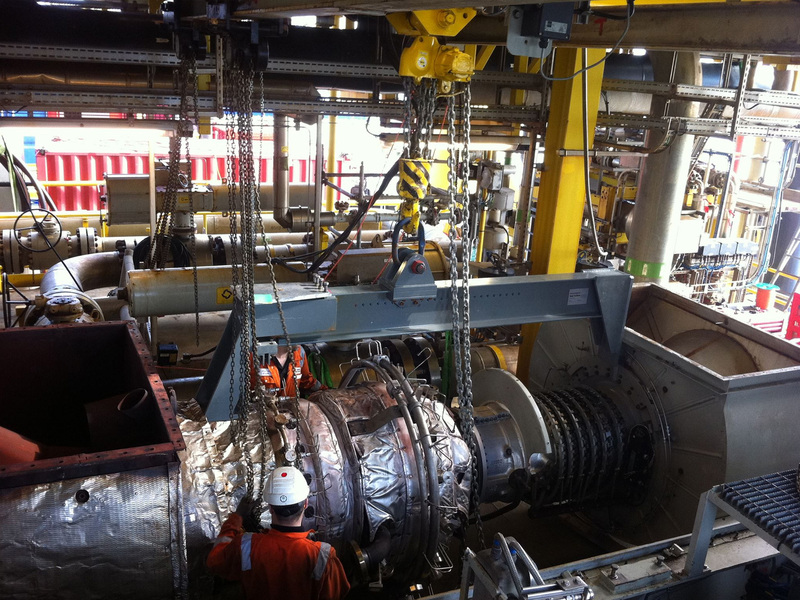 Control operations for the hoist mechanism were incorporated into a JDN E-type pendant controller providing single speed control of the raise/lower/traverse load movements. 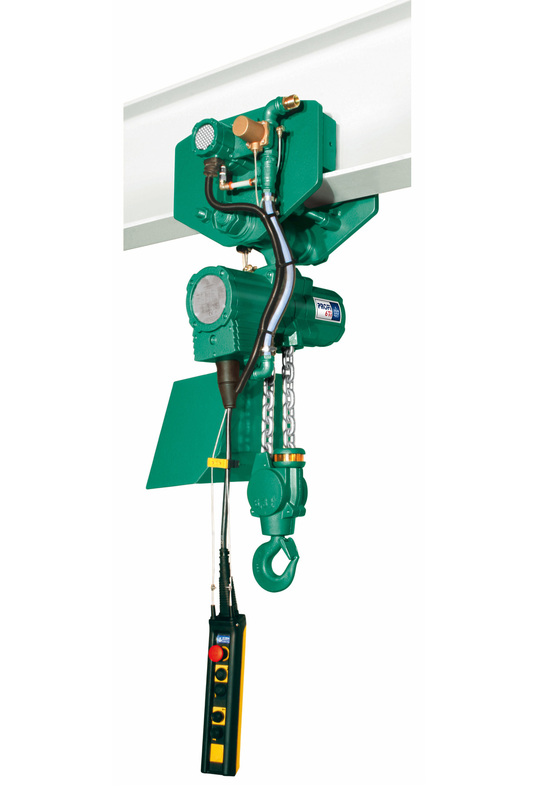 The current range of Profi TI air operated hoists manufactured by JDN comprises 13 models covering individual lift capacities from 250kg to an impressive 100 tonnes. All these models are suitable for use in explosion-hazardous areas, as typically found in offshore environments, providing unbeatable advantages over conventional electrically driven handling products. They are all designed for easy, quiet operation with 100% duty ratings and unlimited duty cycling. The models include low-headroom and lightweight characteristics, with all hoists also featuring lube-free operation. They are also insensitive to dust, humidity and operating temperatures ranging from ‑20°C to +70°C, and combine strong, fast, silent operation with safety, as well as oil-free and low maintenance performance. Their Ex classification according to EC Directive on Hazardous Location 94/9/EEC is as standard: EX II 2 GD IIA T4 / II 3 GD IIB T4 and with increased spark protection EX II 2 GD IIC T4. Hoists featuring hydraulic drive mechanisms are also available.